Are you feeling tired all the time? Experiencing poor concentration? Memory loss? Headaches? Confusion? Have you been tested for acidosis? A number of culprits may be to blame for persistent tiredness and poor concentration including an underactive thyroid gland, low iron levels, poor adrenal reserve (from long-term stress), pathogenic load (viruses, bacteria, parasites, candida overgrowth, moulds etc), but have you considered your body being too acidic? These symptoms can be early warning symptoms of ‘acidosis‘ – an acidic system, a low pH. This is why seeing a naturopath who can examine your pH levels is helpful. I combine iridology, pH testing, BICOM® bioresonance testing, and assessment of blood test results to determine your acid/alkaline balance or imbalance. Taking a closer look at blood test results, particularly the electrolyte balance (sodium, potassium, bicarbonate and chloride) can tell us if you are in a balanced electrolyte state, alkaline or acidic state. Usually, low sodium and a high ‘other anions’ reading on a blood test will indicate an acidic pH. If other causes have been ruled out, then simply improving (increasing) the body’s pH to a more alkaline state can help ‘put the spring back in your step’. Support adrenal activity – minerals, herbs, licorice tea! 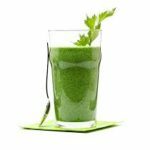 Consider ‘energy’/mitochondrial medicine such as carnitine and Coenzyme Q10..
Support kidneys – drink adequate water, decrease caffeine, drink dandelion, nettle tea and green smoothies such as this recipe below! Open the young coconut carefully with a cleaver. Strain the water through a sieve and scoop out the flesh with a spoon. Place coconut flesh and coconut in a high speed blender together with green leaves, apple, mint, protein powder, alkaline mineral powder and probiotic powder (if using). Blend at full speed until velvety smooth. Serve immediately. Want to find out your pH levels and WHY you are tired and can’t concentrate?